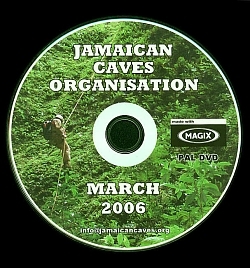 This DVD contains the full-length, 25 minute video documentary of the March 2006 Expedition, which will soon be presented on Jamaican television (we'll post specifics on this when we have them). Five caves are covered: St Clair Cave, Rudist Rock Cave, Smokey Hole Cave (a first descent into what is now known to be Jamaica's deepest cave), Vaughansfield Cave, and Dunns Hole Cave (the first descent into this, the largest natural chamber in Jamaica, in 49 years). The participating cavers were Guy Van Rentergem, Hilde De Splenter, Stefan Stewart, Elizabeth Slack, Ivor Conolley, Adam Hyde, Knut Borstad, Barb Gottgens, Wayne Francis, and Roger Hendricks. The original footage was acquired by Guy Van Rentergem, using a very good quality video camera (which he managed to not destroy in the process), during a JCO expedition that took place from March 21 to April 2 of 2006. Afterwards, it was edited by Guy into what we think is a very kriss final product, complete with music, transition shots, and some great video. Three of the cave visits, St Clair, Smokey Hole, and Dunn's, were of historical significance. An excerpt, for Smokey Hole, reduced in size and compressed for the internet down to 48 MB, can be found here (right-click and save as). The DVD is available in both NTSC (N. American standard) and PAL (European standard) at a cost of 30 CDN$ including shipping, payable by Paypal in most currencies (check conversion rates here). Please contact us via email as soon as the order has been placed, so that we are sure to know about it. We'll send you back a confirmation. Shipping for NTSC is from Canada using Canada Post, and we send them out within 2 business days. Arrival is anywhere from 6 - 15 days later, depending on where you are. PAL versions are shipped from Belgium, and the same delivery time applies. This 287 page, 8.5 x 11" book is based upon our report submitted to The Nature Conservancy in 2005, on the caves component of The Parks in Peril Project. 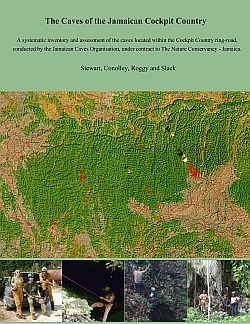 It includes overviews of the nine areas into which the sites were divided, as well as access information, maps, rapid assessment data, and field reports for about 90 caves, and basic information for 60 others. Every known cave and sinkhole in the Cockpit Country is covered, for a total of about 153 sites (we might have miscounted). In addition to the print work, a CD-R is included that has very large, very accurate maps of the cave locations, as well as a very large database in xls that includes more information than that in the print report, and Arcview shapefiles in JAD 69, JAD2001, and WGS84 for the cave locations (these include other pertinent attributes). The cost is 60 CDN$ plus 15$ shipping (Canada Post), payable by money order or Paypal. Please make money orders payable to R S Stewart, and send them to RR#1 Clarksburg, ON, N0H1J0, Canada. Shipping will be within 5 business days of our receiving payment, with arrival anywhere from 6 to 15 days later, depending on your location. For further information, please contact Stefan at info@jamaicancaves.org .